Foam blank, 1/4 inch redwood stringer, Volan glassed with 1 1/2 inch rail lap. Deck patch? Deck: Rolled S deck, possile slight concave section at the nose.? Bottom: Rounded hull in the nose flattening out to the tail. Light Vee around fin to tail.? Rails: High at the nose, 50/50 pinched at the centre and low at tail. 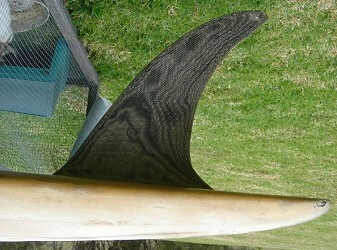 Laminated and foiled black fibreglass Greenough fin. 10'' x 9'' base x 11'' span @ 7'' ? See images right and below. Black text and graphic at sweet spot. Some details appear to be hand drawn. Pencil on tail, image right. Clear with volan rail lap, possible deck patch. 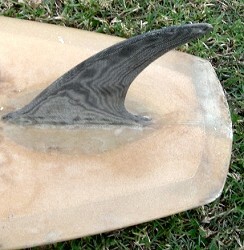 Clear with volan rail lap and fin patch. Images and correspondence forwarded by Henry Marfleet, Ashford, Kent, UK. April 2007. Thickness: 3"+ in middle, but close to rails gets quite thin. 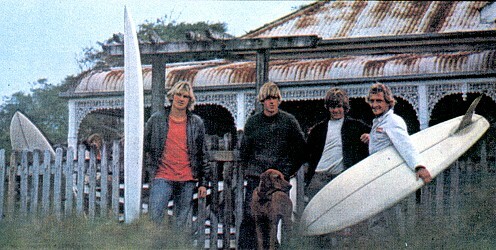 Chris Brock and Wilderness Surfboard, Lennox Head, circa 1969. The images are from Falzon's 1972 film, The Morning of the Earth and have been extensively reprinted, mostly by Tracks and in promotional material. The duo-tone image was printed in Falzon's excellent book of the film, Morning of the Earth (2003), page 45. Volume 15 Number 5, 1971. Following the heavily forward foiled templates of the Tracker and Pin/Round tails of 1968, some Australian designers returned to a wide planning tail, continuing a Greenough influence first seen in the Vee bottoms of 1967. On the North coast of NSW, Greenough proteges Bob McTavish, Garry Keyes and Chris Brock produced wide tailed fin drivers at Wilderness Surfboards, first at Byron Bay and later adjacent to Angourie. See Surfing World, Volume 12, Number 5, 1969. 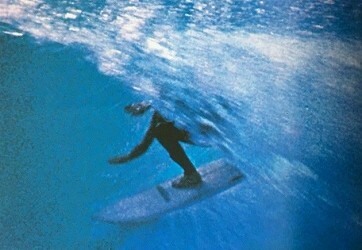 McTavish compared the performance differences between the longer/narrower Hawwaiian designs (Streaks) and the short/wide boards (Slugs) in Streaks and Slugs, a Surfer Magazine article published in May, 1970. The North coast squad was occasionally accompanied by Ted Spencer and Robert Coneely, among others. 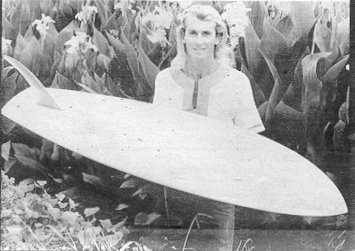 Ted Spencer shaped and designed his White Kite model for Shane Surfboards, Brookvale. Coneely produced similar designs for Queensland's Hayden Surfboards which retailed through his Bondi surf shop. 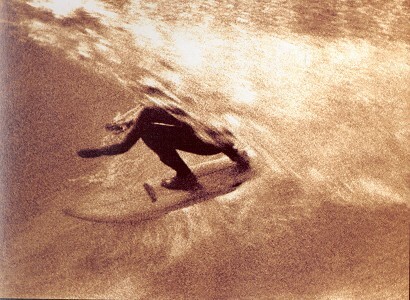 Hayden Surfboards advertisement circa 1970. Generally, the nose section was bowled with a high rail, commonly called a Hull, but some later models featured a chine rail with a defined breakaway edge. An early example of the chine rail featured on a McTavisn design circa 1966 (see #224), appeared on some of Greenough's later Spoons and is commonly found on modern Boogie boards (#30). "(circa 1969) Meanwhile in Australia we were going the opposite direction, the boards were getting short, the rails softer and softer, this is when the Greenough hulls took on with very high rails in the front turning down at the tail. soft rail all the way thru. These boards you could really bank them over on the rail but when you got them over they did nothing." "Rob (Conneely) on one of the few George Greenough shaped stand-up boards. Angourie, 1970." The Australian Surfer's Journal, Volume 3 Number One , Summer 2000. Page 33. First printed in Tracks magazine,circa 1971, reprinted in Nat:History, page 107.
and subsequently imported via George Greenough and Chis Brock to northern NSW. Chis Brock, Garry Keyes, George Greenough, Bob McTavish. Chis Brock, Garry Keyes, George Greenough. Falzon: Morning of the Earth (2003), pages 44 to 47. Surfing World Magazine, Volume 12, Number 5, 1969. Surfer Tips : Number Forty Five SurferMagazine Volume 11 Number 2 May 1970, pages 27 and 29. The nose image, below, attempts to show the deeply bowled forward rail, charateristic of Greenough/Brock designs of the period. Geoff Cater (2007-2018) : Catalogue : Wilderness Hull, 6ft 8", 1970.